Chumbawamba really is an underrated band — like a lot of one-hit wonders, their one-hit ended up doing them in in the eyes of 99% of music listeners. For a long time, I couldn’t stand ’em just because of the ubiquity of “Tubthumping“. Luckily, I was working at my college station when Readymades came out, and I listened to it and loved it. It still took me a while to get the other albums, but I’m full-on converted… and I even like “Tubthumping” now. ABCDEFG is a concept album about music — if the title didn’t tip you off. Politics, like with all of Chumbawamba’s albums, are still in the forefront, though this one is more a cultural history than a manifesto. While still in the folk vein, this album is a little bit poppier — in that aspect, too, reminding me of Un. If fans may have drifted away from Chumbawamba, ABCDEFG will get them back in the fold. There are a lot of stand-out tracks; almost all of them, in fact — and there aren’t any stiffs, either. The second track, “Voices, That’s All” would be my recommendation for a single — if such things made sense anymore, anyway. “Voices, That’s All” is a celebration of how a song sounds better when sung by a large group sharing in the joy and music. While the song itself takes place at the end of WWI, the point is universal. “Torturing James Hetfield” is an interesting song, based off of Hetfield’s idiotic comment of being proud that Metallica’s music was used to torture captives in Iraq. The song puts Hetfield in the reverse position, and, cheekily, the album that gets him to break is Chumbawamba’s greatest hits CD — though, as the backing vocals point out, “there’s only one”. Other politically-driven songs are “Hammer, Stirrup and Anvil” and “You Don’t Exist”, both about Communist governments suppressing music — the former about Shostakovich’s hidden Stalin-era compositions that’d get him sent to the labor camps, the latter about a band in East Germany whose performance license was revoked and their albums deleted due to their lyrical content that was often critical of the government. Lots of the album, though, is just about how music affects us — “Underground” is a salute to all the people — band included — who listened to transistor radios under the covers when they should have been sleeping. “The Song Collector” is a put on of folk music collectors who wouldn’t actually collect folk music — by changing it, cleaning it up, or, in this instance, not doing their research and not getting actual traditional folk songs. “Singing Out The Days” is about the soldiers in the trenches making up songs to get them through the war — a song that bridges the personal and political. Likewise does “Wagner At The Opera”, about a Holocaust survivor interrupting an Israeli orchestra performing music by Wagner, a raging anti-Semite who was a big influence on Hitler. The song is from the point of view of the man thrown out, but the liner notes are open-ended. There’s actually a lot of unpacking one could do here — is music music, or should music be judged by its creator? Should we boycott Wagner’s music for his repulsive beliefs, or play the music while acknowledging that its creator was an awful person? I’d probably have to go with the latter — though I’m not sure where other people (including Chumbawamba!) stand, and it’s certainly an interesting issue. I also particularly love “The Devil’s Interval”, about how the church banned, well, the Devil’s Interval, a particular pattern in music, for example a C to a F# or a Eb to A — both examples given by Chumbawamba. The song closes with a sung coda demonstrating the particular interval — and while said interval is often used to put people on edge, when Lou and Jude sing it, it sounds quite beautiful. In fact, the entire album is beautiful. I can’t recommend it enough — even if you’ve not been a Chumbawamba fan in the past, this might be your ticket in. And I haven’t even mentioned other songs I adore like “Ratatatay”. 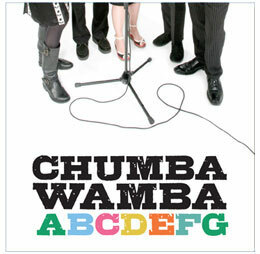 It’s out in the UK now, and Chumbawamba have released it in North America via CD Baby and iTunes. Check it out now!